Can you take a day off, no regrets? for much academic accomplishment, yet somehow, by the end of the day, success is declared after those intentions got left in file 13; afterall, “at least everybody ate and the Bible was read.” Benjamin Franklin said, “Don’t confuse motion with action” – meaning just because we were busy doesn’t mean that we responsibly completed our duties. No doubt, Satan grins wickedly knowing that “today” the distraction ploy worked and we did not accomplish what we set out to do for the Lord. The Bible gives such clear examples, like Nehemiah and the rebuilding of the walls, for prioritizing our life, defending our home, and doing all to the glory of God. As folks keep telling me, “They grow up so quickly.” Time is but a vapor. So all the more reason for us to strive to use every minute effectively as we homeschool. Mommy always says and now AbiNoelle quotes also, “The more you grow, the more you know”-Grow meaning growing in knowledge. The more we teach AbiNoelle and help her further develop her talents, the more she will be able to give in service to God. Thankfully, we chose to organize our school year by starting on the first of August. Now, as we enter the busy fall time with many birthdays and holidays, we can step back, enjoy this time, and take a few days off, knowing that our 180 lessons will still be completed by early Spring. No regrets, no worries, and no sigh when good intentions are swept under a rug. Several days this Thanksgiving week were set aside to enjoy special harvest crafts, fun papers, and activities. 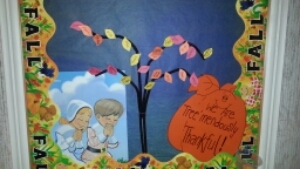 Mrs. Wasser started each day with the true account of the Pilgrims and the reasons for their thanksgiving to God. Mrs. Pintar followed up with Pilgrim and turkey pages and the cornucopia and turkey crafts. Getting the glue gun ready. 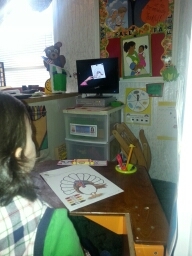 Mommy helped review our thanksgiving poems and complete some special fun projects. And look at that Thanksgiving tree! – It’s full of leaves! – That must mean it’s Thanksgiving! From all of us here at the Lilly House……Have a blessed Thanksgiving!